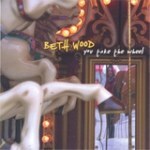 You Take the Wheel is a solo acoustic project in which Beth asked fans to vote on the songs they would most like to hear in an acoustic setting. This release highlights Beth’s solid work as a strong, dynamic solo artist. People were always asking — why doesn’t BW have a CD that sounds like her live show?? So for all you folks who love the folky, solo acoustic sound, this one is for you! Produced by the great Chris Rosser. Recorded live in studio and at The Grey Eagle. Supermodel, supermodel, can you fly? Supermodel, supermodel, what makes you super and why? Do you leap tall buildings in a single bound? Do you beat up bad guys all over town? Do you sneak Oreo cookies while no one’s around? I wonder if the Man of Steel believes the hype? How does that little bitty body hold up that great big head?